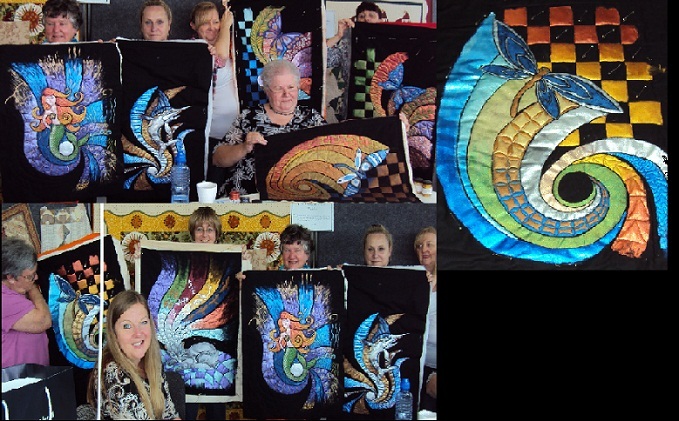 Hobbysew Kings Park’s “Australia’s Biggest Morning Tea” is on Thursday 30th May. See ya there! 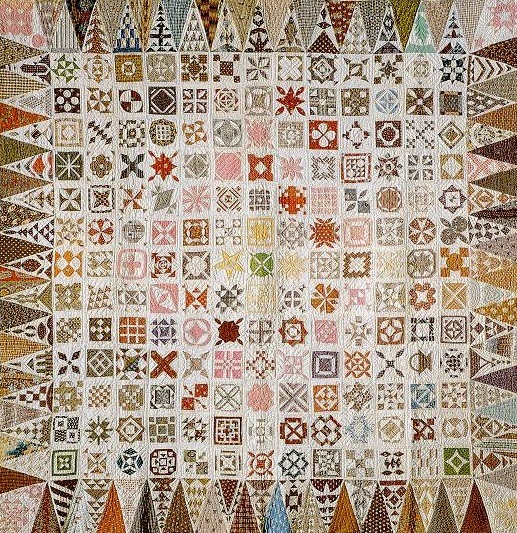 This is your chance to have a go at this most famous of all quilts which hangs in the Bennington Museum, VT. You’ll need to buy the book, which is available in store, and Julie holds ongoing classes on all the different techniques used in each block. Jane A Stickle originally made it in fabrics from the Civil War era but why try it out using your own contemporary colour and pattern choices. Just phone Kings Park on 9621 4000 to join the class. 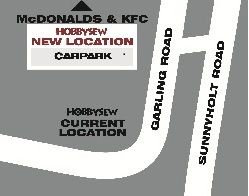 New Kings Park store conveniently located in the same complex as old store! Don’t miss out on these fantastic specials but note Fabrics Minimum Cut 50cm. No further discount applies. It’s Party Season at Kings Park!! The news is finally out – Saturday 17th November is the date of Kings Park’s Birthday Party & Grand Opening celebrations at their new store opposite Subway in Garling Road. To celebrate they are having an End of Bolt sale of 35% off fabric if you buy to the end of the bolt. Subway is also sponsoring a free lunch of Subway sandwiches, so get in quick while they last! Monica’s theme,“Designs that inspire creativity” truly sums up her beautiful work. At Hobbysew, Monica passes on her special secrets and tips that she uses to make her signature creations. Monica’s class at Hobbysew Erina is busily sewing up a storm with the fun and funky Fancy Free Quilt where students learn to stack & whack, stitch & flip and some simple twisty quilting techniques. Monica also teaches her favourite fully machine-sewn, quilt-as-you-go, construction & machine-sewn binding techniques. 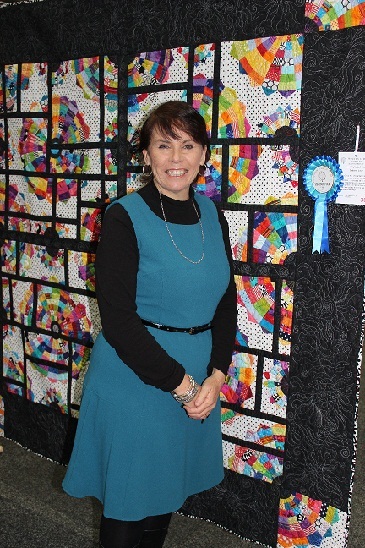 If you want to create quilts and clothing like Monica, limited spaces are still available for her upcoming classes, but you need to be quick to get your name down. She will be teaching her Sea Spray Quilt, using the techniques of stitch and flip, sketchy free-motion applique. Or there’s her Day Tripper Bag, which is just the right size to fit your purse, a book, a bottle of water and a cardigan. Plenty of pockets, including a very simple to apply internal zipper pocket. For dressmakers, Monica is teaching the adorable wrap-style dress, Rosie’s Wrap, one of the latest Mini Moonshine designs, where you will learn basic garment construction and polish up your dressmaking skills with Monica’s handy advice and tricks of the trade. 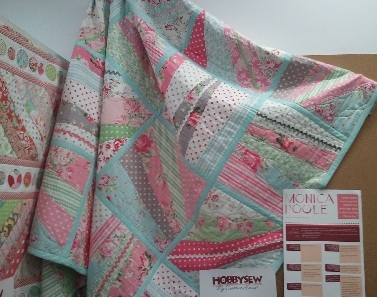 For Monica Poole fans, patterns & books are available at Erina and all Hobbysew stores. Monica also holds classes at Figtree and Kings Park. Check for details at the Classes tab.